Today I am super excited to introduce my friend Sara Knighton to you! I met Sara on Instagram back when she was living in Hawaii and when she and her husband relocated to Astoria for work, we finally met in person and I am happy to call her a friend. When Sara is not working at local hot spot Blue Scorcher Cafe, she is jugging a screen printing business, weaving on her loom, selling her wares at the Astoria Sunday Market and playing in the ocean. She is one of those people who thrives on making things and loves learning, experimenting and getting lost in the creative process. 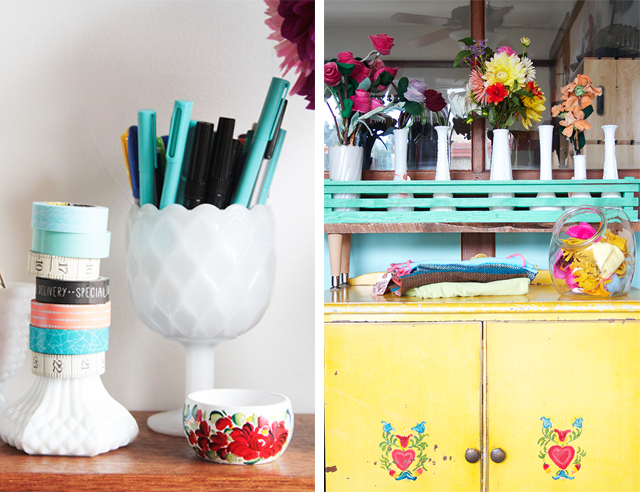 I recently photographed her studio and today I am sharing a peek into her world! Tell us a little bit about yourself and your journey with art. This story has been told thousands of times, but I've been creating and hoarding supplies since I could walk. I used to sneak into my mother's art supplies and make the biggest mess. I joined the United States Coast Guard when I was 17 years old. Let's just say I watched the the film Blue Crush one too many times and really wanted to learn to surf. I learned to surf at Oswald West State Park, Oregon and then I moved to Hawai'i for 7 years where I became a real mermaid. I had ocean on the brain and painted waves and surfers for years. Now, I paint mermaids and weave scarves to keep me warm after a cold water surf session. I recently visited your studio space and it is so cool! Tell us a little bit about the space. I am one of the most fortunate people I know. My studio space at the Young's Building is like a dream come true. It sits in downtown Astoria across from the Street 14 Coffee and next to Gimres Shoes. The building was built in the early 1900's and actually survived the 1922 fire that devastated the city of Astoria, where hundreds of people became homeless and suffered over $15,000,000 in property damage. Young's Building served as dental offices until the1980's when the spaces were converted into the Street 14 Art Studios. 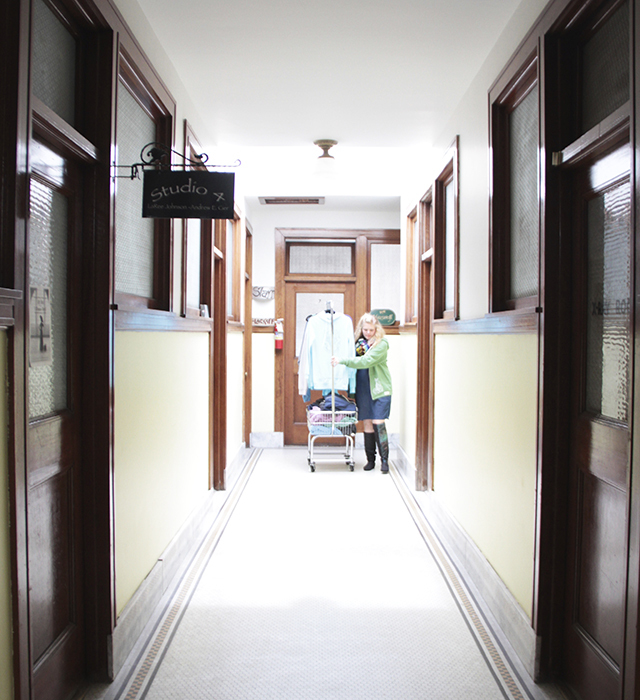 The building is beautiful and offers space to local artists in the healing art, textile, water color and mix media. The space makes me feel special and important. It may sound silly, but when I'm in there, I feel magical. Can color be considered a medium? I love color!!! Anything that incorporates color from paint to fiber. Well, I guess if I have to choose my favorite medium, it would be the human body. There is something about using our bodies to express ourselves through fashion, photography, tattoos, and cosmetics that makes me create. Like you Alisa, I believe in making functional art. 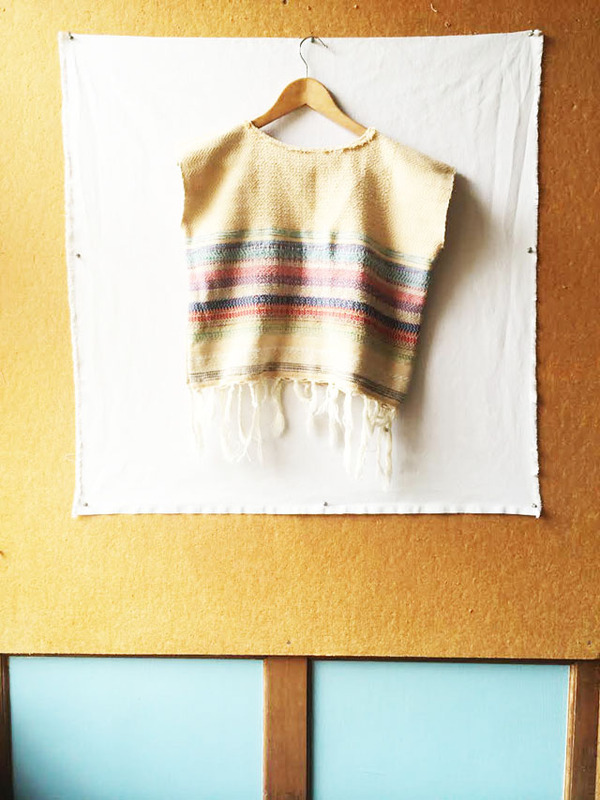 Lately, I've been playing with textiles, paint and fiber. One day I would love to become a tattoo artist. I get up super early, but then I realize it's sunny outside and eventually get to my studio. I work full time at the Blue Scorcher Bakery and Cafe in Astoria, Oregon. So typically I'm juggling art in between the bakery, ocean and my dog. You can always see what I'm up to on Instagram @maidenofthepacific. I know that you juggle a lot of different projects. 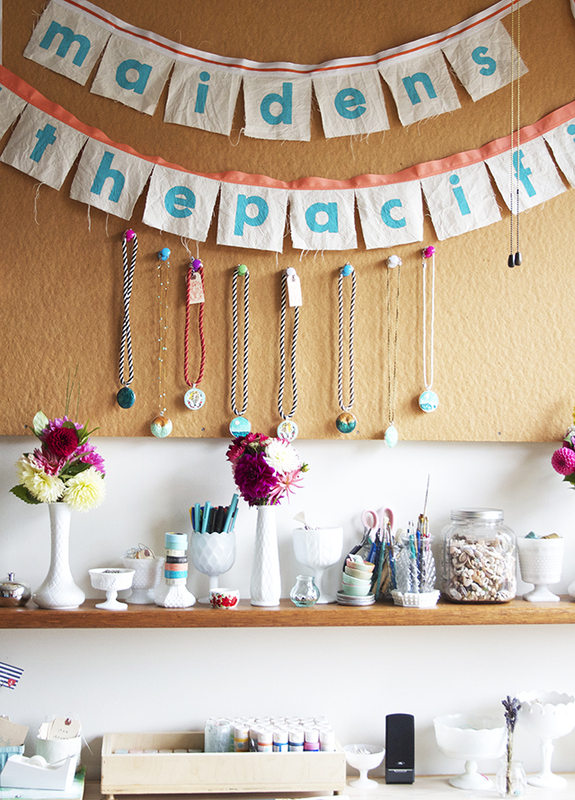 How do you organize your creative schedule? What is organization and a creative schedule? Hehe. I'm kind of a creative hot mess when it come to my schedule. Sometimes when I juggle my projects, a few of them stay up in the air for a while. They eventually fall down and I finish them. I have a crazy quilt from 2004 I need to finish. Sometimes I use a check list, but my biggest reminder is my husband telling me to finish the project on the dinning room table! I'm building my mini screenprinting business called Maidens of the Pacific (www.maidensofthepacific.com) where I offer screenprinted hoodies, t-shirt and tanks. 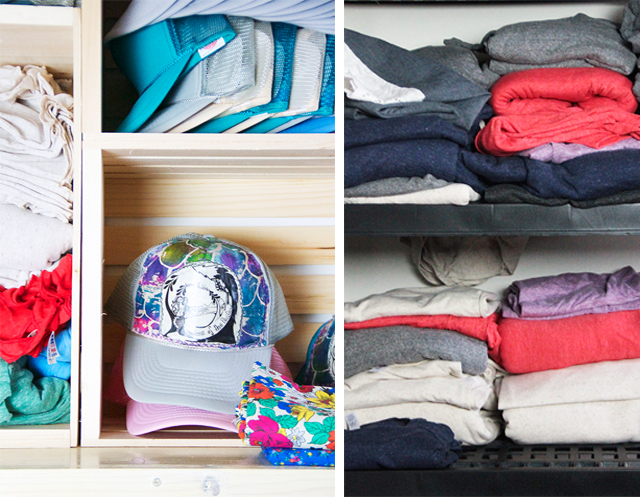 all apperal is made in the USA and printed by me in Astoria, Oregon. 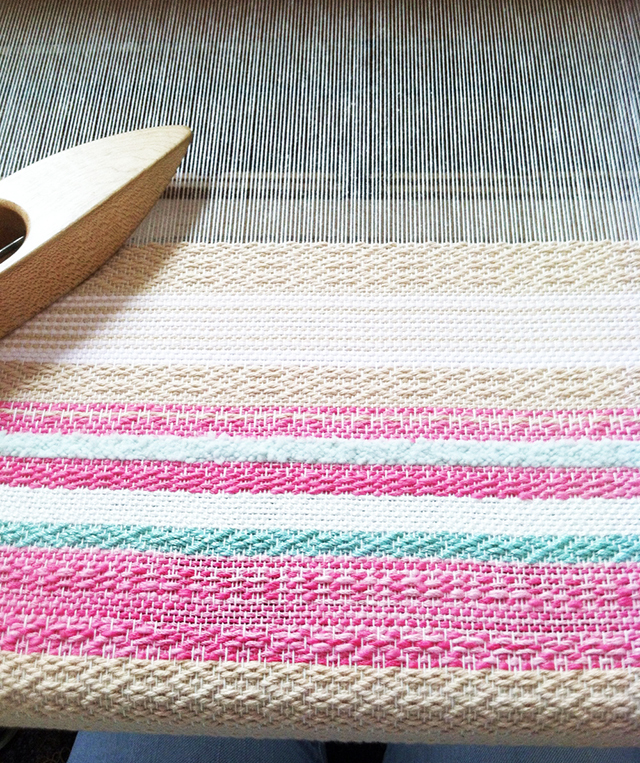 I've been weaving at home and printing at my studio. I love infinity scarves and have been working on my own design. Today Sara is giving away one of her screen printed hoodies! The ocean is Sara's greatest inspiration...tell me where you get your inspiration from. I'll randomly draw a name and announce the winner at the bottom of this post in a couple of days! I envy her studio! I wish I have one someday. My biggest inspiration will be about the beauty in everything. flowers dancing in the wind, the colors of food that we eat, night lights, even the random conversation in the afternoon. Right now your sketches inspire me to sketch again. It's hard at first but when I start to draw more and more I just can't seem to let go of my pen. Thank you Alisa! I love your studio, Sara! Nature always inspires me. I'm mostly captivated by all the lovely details in plants and flowers. Color is also inspirational as are fibers and textiles! And...when your heart is open there's beauty to be discovered just about anywhere! Sara's studio is amazing. Everything inspires me especially nature. Flowers...lots of color...inspire me. I love color...the brighter and bolder, the better. My inspiration comes from anything in nature, mainly in the forest or the seashore. 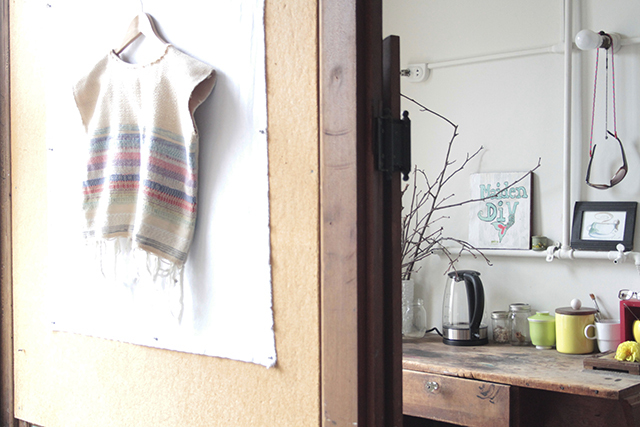 I love Sara's studio - how beautiful. I'm inspired by light and seeing how things change (or at least how we see them changes) just through small changes in the way they are lit. I also love anything associated with the water. We walk our dogs every day in a nearby park. Just being out in nature with the beautiful colours and open spaces is inspirational and gets my creative juice flowing. I love Sara's studio - makes me feel magical. I love looking at books and magazines. je trouve l'inspiration sur différents blogs pour les techniques et idées et dans la nature.. la forêt, les arbres, j'adore les dessins que forment les branches des arbres. Traveling with my children inspires me! They always notice the little details that I might have missed. Sara's prints are wonderful ! As a native Oregonian transplanted all the way on the other side of the country, I feel a mixture of happy and homesick after peeking in her shop. I get a lot of my inspiration from "close ups" I look at something and zoom in with my eyes or camera to a specific shape or colour and end up turning that into a drawing, painting or illustration. Lots of fun! I never quite know where inspiration comes from. It's usually in nature - what a beautiful sky this morning. And so excited to see the work from the beautiful state of Oregon. thanks for sharing it! Enjoyed getting to know Sara, I can see why you two are drawn to each other! My inspiration comes from a lot of different places, mostly nature but a lot from other artists, I read blogs take online classes and live classes (when available). Would love to win one of Sara's screen printed hoodies, thanks for the chance. Wonderful post. Sara sure keeps busy! My inspiration comes from books and magazines of all types - interior design, abstract art, quilting, and landscape. Almost every year, since my youth, I go to a little island called Menorca, in the Mediterranean Sea. Turqoise sea, pink sunsets, yellowish limestone and green pine trees. That's where most of my inspiration comes from. Just love that island! My heart aches a bit just by thinking about it, so beautiful. My home and family, our garden, thrifted stuff (including books) and the internet. Inspiration is in daily stuff. I'm inspired by sunsets and starry nights and silhouettes! When I am feeling stuck, a walk, or even a drive, viewing the beautiful nature in northern Michigan never fails to inspire. I am inspired by pretty much anything in nature. 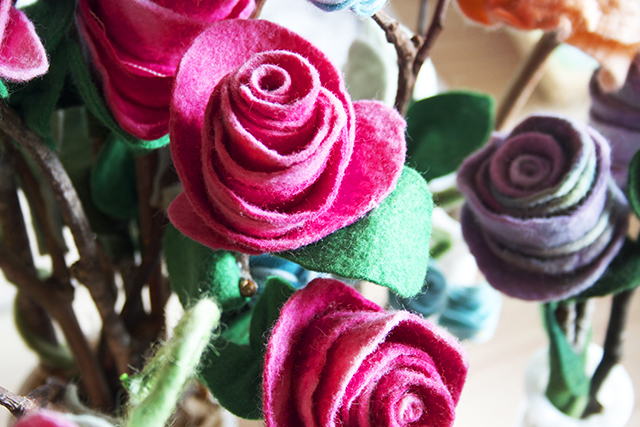 I took your Flower Power class and am especially inspired by all things flowers right now. I'm a water baby, so I definitely feel inspired after a day with my toes in the sand of Lake Michigan. During winter months, I am most inspired by my family. Hehe that is so true!!! My inspiration is my mountains here above Denver, Co. Specifically TREES! MORE SPECIFICALLY...ASPEN trees! I love them and paint them and have been known to even talk to them! HA. My kids inspire me. Also nature both the small, often overlooked pieces of nature that I love to collect (pebbles, pine cones, fallen leaves and feathers) as well as the grandiose (an amazing sunset, the ocean, an amazing mountain panorama, the sky full of stars). 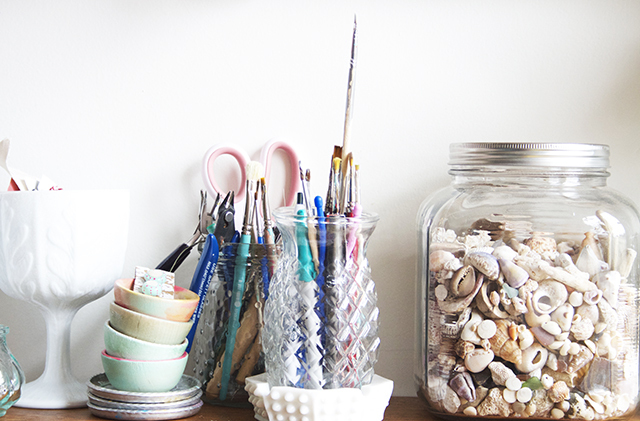 I am inspired by her use of milk glass to store supplies! And the turquoise shelf. Totally inspired by that color. Here in Saskatchewan, we call hoodies "bunnyhugs." I love the milk glass too and those boots! I am inspired by nature and by my puppy who reminds me to play. inspiration = morning light falling through the kitchen window; a drive down a forgotten rural road; a change in the season; discovering new music + new artists. Thank you for introducing us to Sara....such a lovely artist and a beautiful studio. I tend to be most inspired by nature. I love the beautiful simple inspiration that most tend to take for granted. Nature and sunlight. I love when you highlight an artist. Some of my favorite posts! Go Sara! What an absolutely inspiring studio! Thank you for the introduction to Sara!!! just returned from visiting Sara's shop and blog. loved the mermaid skin necklace. very unique. my main source of inspiration is color. anything with great color attracts my attention. i have a rather vivid imagination and can see patterns that provide ideas for backgrounds or whatever. I am inspired by nature. What a beautiful space Sara has to create in. Wow! What a great post. Thank you for introducing us to Sara. Her studio is so cool! (As is yours Alisa :) I am always inspired by Flowers, I absolutely love them...I use them in my work more than anything else. Thanks for the tour, Sara. You've got a relish studio there and a stream of projects to keep it humming. 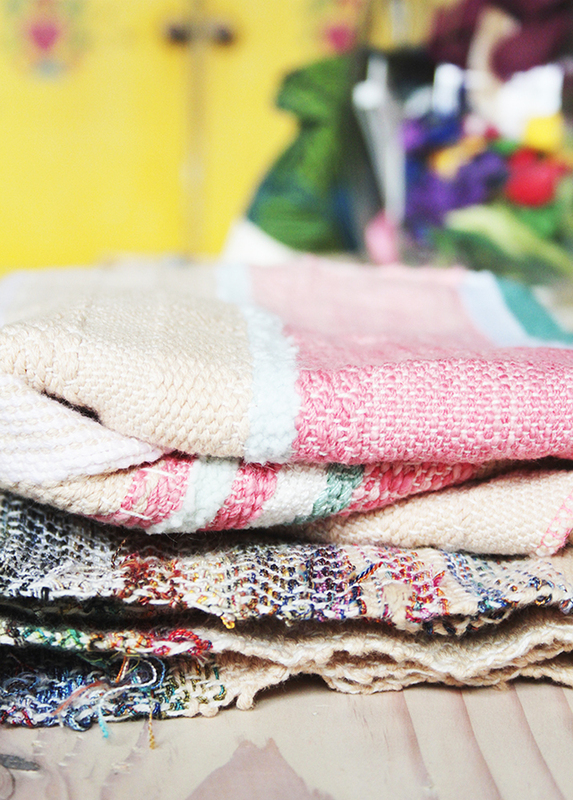 Love your textile art! I'm located waaay up north on the opposite coast, tucked into Maine's largest island, Mount Desert. It's a mix of granite coastline, sandy beaches, lush forested mountains and big lakes. I'm inspired by the four distinct seasons we are treated with each year. From frigid temps and heavy snows to the rush of heat in spring and new growth to summer's thicket of tourists and now autumn's styled MDI with her usual glam- gold, red, orange and evergreen. Sometimes it's hard to keep up with the ideas Mother Nature dishes out! 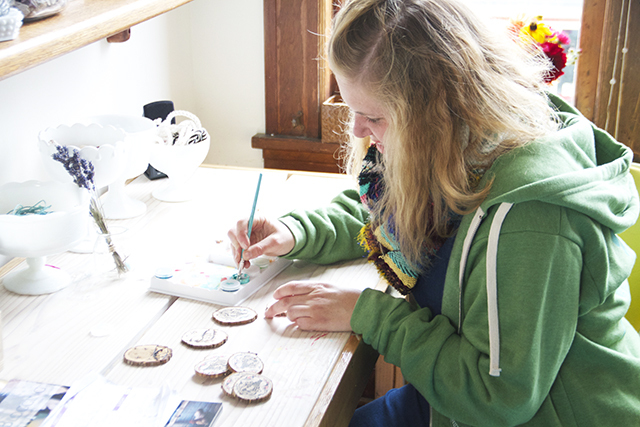 What a lovely peek into Sara's work and studio! I too lived in Hawaii for over 11 years and the ocean is always home to inspiration for me, however, I now live in the green hills and countryside not far from the sea so I have found this space surrounding me to truly inspire as well. Life in the country inspires my artwork. We have a small 3 acre homestead and I love using wood found on our property to create signs and mixed media paintings. I also love painting our chickens and photographing our other animals like the sheep and alpaca. I keep a camera handy whenever I am working our farm just in case inspiration hits. Be still my heart! Every time I pass through Astoria, I feel a little bit transported in time. It's such a quirky, in a cool way, town! What a great studio space you have Sara. We are kindred hearts....I declare colour to be a medium, :)! Well, with the exception of swimming in the Pacific Northwest waters, LOL. A wee bit chilly for me. I draw inspiration from EVERYTHING! One day is from tourists on a busy Vancouver street corner, another it's an autumn leaf. I am always inspired by colour! Would love to win! Enjoyed this post. Love your blog, Alisa! Sara seems like such a fun personality! Thanks for sharing. I grew up on a farm in the midwest, and that's what inspiration looks like to me. I love to sit on my front porch and watch the sun set over the soybean fields. It's like a brand new painting every night. Sounds like nature is your studio! Yup, the ocean ranks right up there. If I lived at the coast I wouldn't get anything done for wanting to beachcomb all the time! Wherever I am, I notice every day moments. I also love architecture. Right now, in Ecuador, mothers going about their work with their children especially draw my attention. The bright colors and beautiful architecture are also captivating. A girl of many talents....no wonder you two became friends. Love her work, and the interview revealed a fully rounded and enthusiastic person. My kinda gal. Most inspiring: anywhere in the Pacifc Northwest, each area is so vast and different and speaks in its own voice. Most peaceful: the Oregon coast. 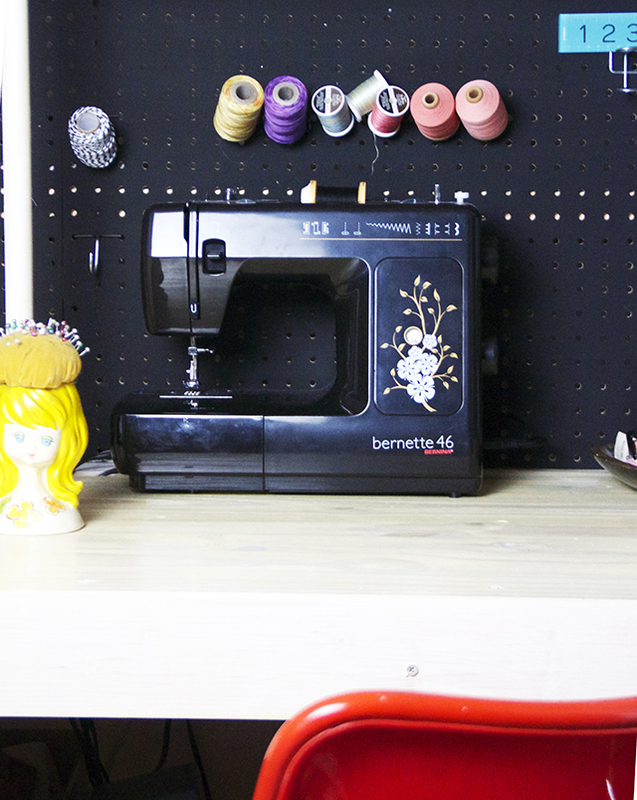 Thank-you for this peek inside Sara's studio! So inspiring! Cheers from Vancouver Island, Canada. I'm inspired by old things - vintage photos, antiques, clothes. I also find inspiration at yard sales - looking over things people are getting rid of and thinking of how I could repurpose them. The area where you live is wonderful - I've been there! I've always wanted to live on the ocean - nothing like being lulled to sleep by waves washing up on the beach!! Inspiration comes from a moment: all of a sudden I'm aware of everything, every little movement I'm making, color I see, shape I see, in that moment....and this often happens around my old stuff I collect or just "doing the daily" of life. Thank you so much for sharing such a wonderful friend. I cannot imagine have a kindred spirit to call my friend. How blessed you are. Inspiration is all around me. I feel the same about the mountains that you do about the sea. I get my inspiration from my 4 young crazy kiddos. There is never a dull moment with their ages ranging from 6 down to 1. But I also love natural lines/shapes in nature and anyone who can capture that! I get my inspiration from the fashion people wear on the train. I'm always looking what colors people are wearing so I can use the colors on my art journals and canvas. I even have a small book dedicate to the different color combo I see. Beautiful work and love those boots :-) I am inspired by flowers and butterflies. Both appear in my work often. 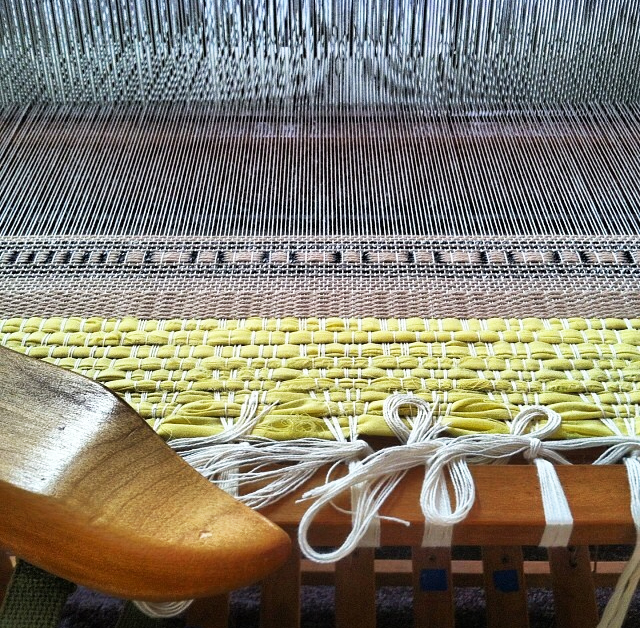 Oh man, I love to weave. It's always great to hear that other people like to do that besides me! I am inspired by color...in nature or really anywhere. I also take inspiration from my girls and their playful spirits. I LOVED reading about you, Sara! Your work is so awesome and I'm a fan of everything you do (which you already knew) :-) I too draw inspiration from the sea. It's my favorite place! I am inspired by the sea as well...having lived 2 blocks from the beach for nearly a decade...now I am stuck uncomfortably inland - but the soul of the ocean is still in me! I would love to win a hoodie for my granddaughter's 23rd birthday :) Wishing everyone here good luck! I am greatly inspired by nature. My favorite places to go for inspiration - Lake Michigan, a nearby inland lake, and our town's botanical garden. 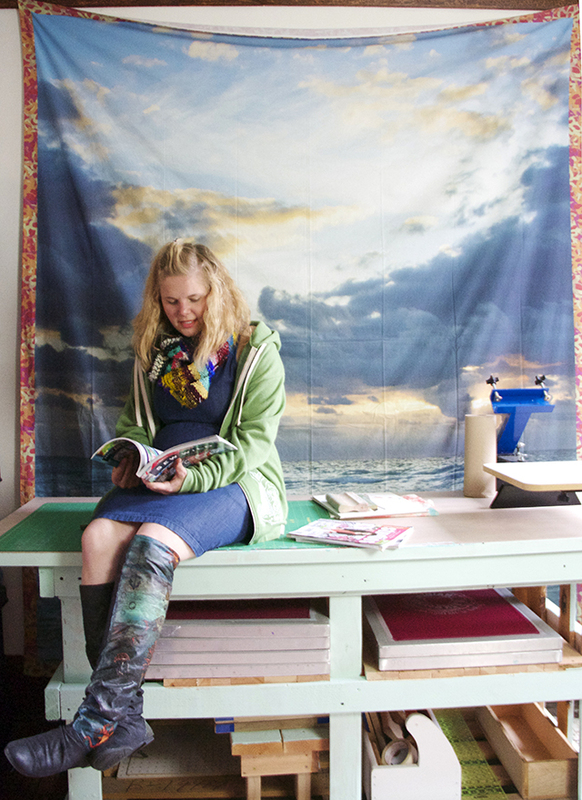 Thanks for the chance to win and I love Sara's studio! Nature is definitely my inspiration! Although I'm not a mermaid now, I definitely was one in a former life. I have lived near the ocean for most of my life and can't imagine living somewhere inland and being landlocked. Thanks for a chance to win one of Sara's creations! The ocean is definitely my inspiration & the colors in my house reflect the colors of the Carribean. My husband like to tell people he married a "selkie"! Thank you for the lovely interview/post. I am inspired by my surroundings, it might be a leaf that has fallen on my path or the fabric of a scarf someone is wearing. Anything from the natural world--flowers, twigs, seashells. Great interview. Love the pics. My inspiration comes from the outdoors. Being outside by myself opens up my mind and allows me to come up with ideas. Lately inspired by flowers and wide open spaces. I get inspired by our beautiful fall weather and colors in Michigan. I love her style and art! I get my inspiration from processing my feelings. It's therapy for me. So when I need to process anger, I paint an angry scene. or when I want to process joy, I paint a joyous scene. Some of my art are gifts. These are inspired by the people I'm giving it to. I am inspired by the beautiful sky and sunsets here in the SW. Thanks for the giveaway! Wonderful to see your Ocean inspired creativity! What an inspiring interview! At 56, I can still learn something. I am inspired mostly by my past & memories. I love recording things I love into my artwork, like family and heirlooms. Love Maidens of the Pacific's style. Lovely color palette and cool designs. Love the idea of functional art (that's what I do mostly,didn't realize it had a name.) I am inspired by other artist like you and Sara. I love her work! Thanks so much for sharing. Beautiful work! What inspires me to create?? Natural wood and natural light inspires me. If Sara is a mermaid, then I am a dryad. As much as I love the water, the streams, lakes, wetlands and fens; it is the woodlands where I get my inspiration. I love living in a lush and woody Michigan, where there are lots of trails for hiking. 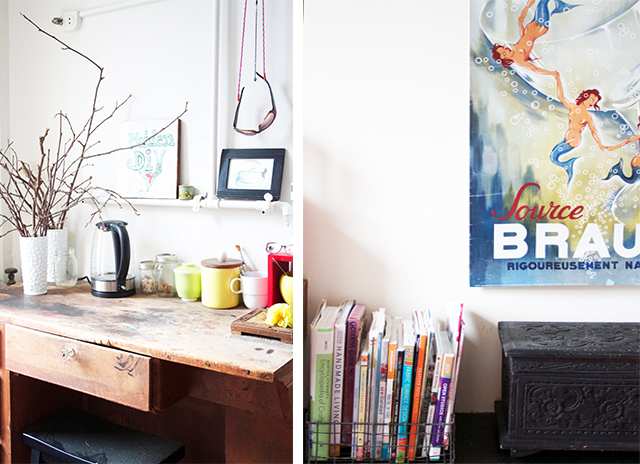 Sara, your space is so lovely as is your gorgeous work! It inspired me today to see your studio and the art you are creating. I find that connecting with other artists inspires me to get going and create too. I love this blog and I'm so happy I found you. I would love to know what camera you use. And how creative to actually visit an artist's studio rather than asking them for pics. I'm a daily painter and so I create roughly 250 new works a year. It wasn't always this way. I used to struggle to finish a painting in a couple of months, but since making a goal to finish a painting a day and sitting down with that intention each day, I find it comes easily. Not so the actual process: Sometimes prep, painting, varnishing, cataloging, is all done in a snap and days I'm still fussing at 11 pm (my blog goes out at 11:30pm each day). So my biggest inspiration is my goal. As to why I paint what I do, I would say I am mainly inspired by light and colour. I could study the way light hits a leaf or a petal and how it changes the colour of the object for hours (and I do). What is blog walking? It sounds interesting. Oh inspiration for me comes from the people around me and nature. Just watching on facebook or blogs the things people create is inspirational there are so many talented individuals out there and its wonderful to have access via computer to so much eye candy! GOD's goodness to me and my family! His beautiful creation that surrounds us!! 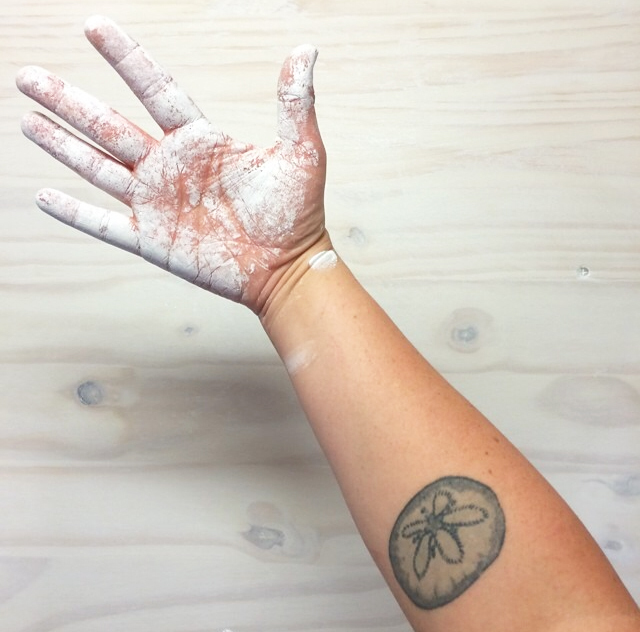 I am a hand papermaker and I am inspired by the marriage of plant materials and water. There is nothing better than turning a weeks worth of vegetable peelings and bamboo, abaca or hemp into a luscious, warm paper. Sara, I love the colors you surround yourself with. Alisa, your art makes me smile. I find my inspiration in nature, in color, in feelings and in great blogs .... like yours! I find inspiration in cast off things. Those things we would normally toss I like to try to find new purpose for those things. And in color. Colorful things inspire me to create too! thanks for sharing. I find my inspiration in trees. They are so calming, strong and inspiring. Reminding me of my roots and my strength, wispering in my ears and heart to go back to my studio and to create! I find inspiration in the things that most people throw away: the tags from the shirt you just bought, the words from a page of a tossed magazine, an old book - I like to make new things from found objects. So many things -- nature, light, travel, tastes! Love Sara's studio! My greatest inspiration comes from walking through the trees. Any trees, any season, I just love it. I find inspiration in color and pattern, especially paisley and batik. 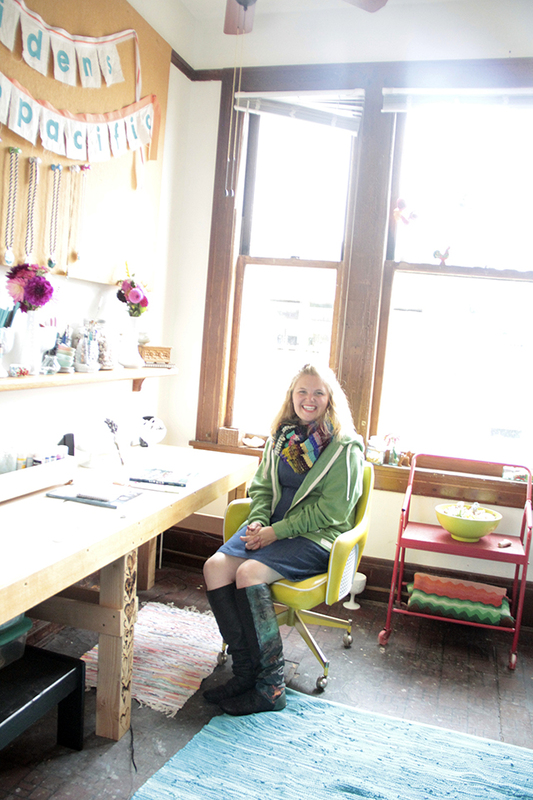 Oh, she seems lovely and her studio is gorgeous! I, like Sara, find so much inspiration in color. Color and anything odd or whimsical, I am naturally drawn too! This was such an amazing post. Nice to meet you, Sarah! I get my inspiration from flowers and the endless color palettes they create! Great meeting you, Sara! Thanks, Alisa , for sharing her fabulous story! I want to know how to become a mermaid! I am inspired by adventures, colors, explorations all around! I love nature, especially the beach, and was lucky to have a booth selling my art on Pier 60 in Clearwater, FL all summer. Being a beach bum artist suits me well! I love to travel! Traveling is the best inspiration...meeting people, new languages, new foods, new everything. I'm always so much more productive while traveling and I try to milk that inspiration for as long as I can after I return home. My greatest inspiration comes from the beauty of God's creation, and all the colors and textures that I notice each and every day. Just can't get enough of photographing flowers, birds, grasses, water, people, art, distressed paint, old barns, boats, sunsets,...and whatever else catches my eye. All of these types of photos influence the type of art I'd like to create. Alisa, I've admired your art for quite some time, and all the creative ways you share that with rest of us. Thank you for that, and how you try to achieve balance as you put that sweet family of yours first! I've enjoyed reading about Sara's story. I love meeting new artists! I am inspired by "my" Smoky Mountains in TN, and by other artists. Thank you, Alisa, for the continual inspiration you generously share. Lots of thinks inspire me. Challenges and deadlines get me motivated. Lately I've been inspired by color. I'm inspired by the colors and shapes found in the kitchen and the garden. Well then, the kitchen garden, which includes, of course, the beautiful flowers growing amongst the food and set among the plates. Love Sara's studio! Looked at some of her shirt designs on her sight. Pretty cool. A lot of my inspiration comes from social issues, the rest are mostly nature inspired. I'm inspired by nature. I love trees, flowers, grass, leaves and the ocean. I grew up near the ocean and now live about 20 minutes away from the closest beach which aslo really crowded. Really miss the ocean. Being outside! I live in Nebraska where beauty, color, and texture is in my own backyard! Children and colors are a great inspiration. Lovely studio. Wow really love her work - all of it!!! 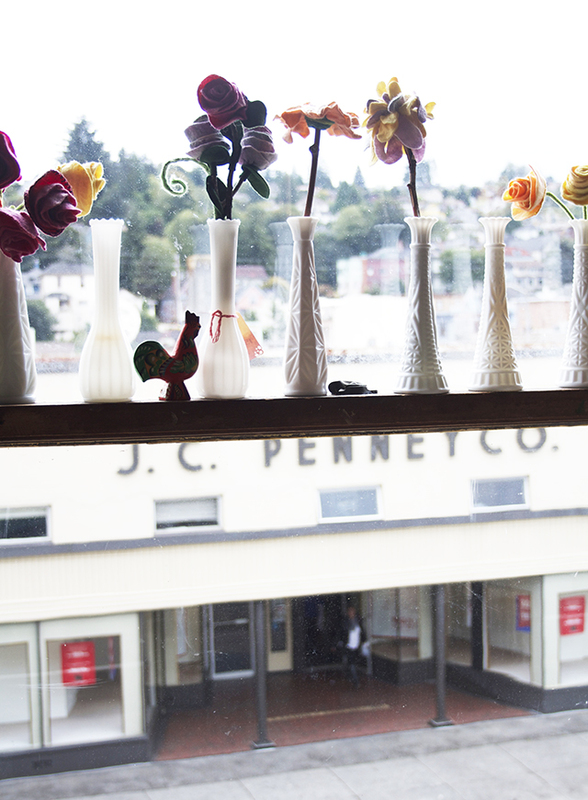 My inspiration comes out my studio window. It faces our two acre wood lot where lots of different trees, flowers and animals are, especially the birds - the colors are just amazing!!! Did you ever draw for the Lifebook class? Where can I get one of those amazing ocean backdrops that Sara is sitting in front of in the last picture from her studio, it is so cool! !